The Womad music festival is to leave its Berkshire venue after 17 years. The World of Music, Arts and Dance has drawn crowds of up to 40,000 to Reading and artists from 100 countries have performed at the town's Rivermead site. Organisers, who describe the event as the UK's biggest festival of international music, said Womad has now outgrown the Reading venue. The council said the news was a loss for the town. The festival is moving to Wiltshire at a site to be announced. Thomas Broonan, a Womad director, said: "We are intensely proud of our achievement together in Reading and all that Womad has achieved in this context has been with the support and endorsement of both the council and the people of Reading since 1990." Reading Borough Council acknowledged the town does not have a venue large enough to accommodate the festival. David Sutton, council leader, said: "My first feelings once the decision was finalised, were of great sadness, something like the sadness parents feel when their children leave home perhaps. "But we have to accept that there are commercial pressures on Womad and also, simply, things move on." The Womad festival was established by musician Peter Gabriel in the 1980s to celebrate music, arts and dance from diverse countries and cultures and events have been held in 22 countries across the world. 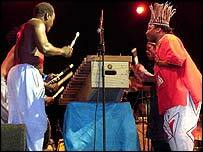 The 2006 UK Womad festival was attended by 40,000 in July and featured 80 artists from 40 countries.